If you’ve never been to WDW, here are a few more tips that apply to all the parks. –Really pay attention to where you parked. Jot it down somewhere if you have to. All the parking lots kind of look the same, and to ride the tram back to your car, you need to know which character lot you’re in. (Row 39 Minnie, for example) I saw quite a few people kind of wandering because they forgot where they parked. –We bought the Pal Mickey toy for $65. Very cool, but not really worth it. The cool thing is that it picks up signals from around the park and tells you some interesting little tidbits about the park. The downside is that it’s hard to hear sometimes, and it doesn’t store any of those little tidbits to hear once you’re outside the park. So, if you’re willing to pay that much for a Mickey doll, then go for it. If I hadn’t lost my receipt, I would have returned mine. –Speaking of souveniers, you can find some really great deals on Disney items throughout Orlando, at much lower prices than in the parks. There’s a pretty good one across the street from the visitor center on International Drive. They have everything from pajamas and toys to suitcases and office supplies… all with Disney logos. –Park Hopper option for tickets is TOTALLY worth it! If you plan to come back again, it could be cheaper to buy more days than you need and upgrade to the ‘never expire’ so you can use your extra days next trip. –You should only have to pay for parking once per day. Save your parking ticket if you move your car. Speaking of parking, parking seemed easiest at Epcot. –We were there on Memorial Day, and it was surprisingly not overcrowded. –Downtown Disney has two free splash fountains to beat the heat. –Will Call is any ticket booth, but it’s faster to go to the customer service booth. At Epcot, it’s to the far right of the ticket booths. –Use Disney transportation. You can bring your stroller on the monorail, and the boat ride from Epcot to MGM. Riding the Friendships boats from Epcot to MGM (and back) gives a nice view of the Boardwalk, and some of the resorts. –Prepare for heat! Sunscreen, battery-operated spray fan, stroller shade, frozen juice boxes, etc. Also, prepare for rain. It thankfully doesn’t last long, and can be a welcome relief from the heat. –Hopefully this goes without saying, but wear comfortable shoes… that goes for the kids, too. 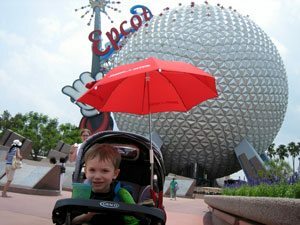 Our day at Epcot, I walked 10 hours. these are great tips. one problem i have is parking list drives me crazy.